BOSTON — When news began circulating that President Trump was planning to pull out of the Paris Agreement, Mayor Marty Walsh was quick to reaffirm the city’s commitment to addressing climate change and reducing carbon emissions. Whether the city has or will adequately “step up,” however, remains a point of contention for some community leaders, activists and policymakers. Undeniably, Walsh and other elected officials recognize the threat of climate change — Boston, after all, is one of the most vulnerable U.S. cities to the impacts of climate change — and have begun to address the issue. In 2007, the city pledged to reduce emissions to 25 percent below 2005 levels by 2020, and paved the way to becoming the first city in the country to require “green” building standards in all public zones. The city’s most recent — and, arguably, comprehensive — action on climate change is Climate Ready Boston, a 400-page report released last December by the Office of Environment, Energy, and Open Space, the Massachusetts Office of Coastal Zone Management, the Boston Planning and Development Agency and the Green Ribbon Commission (GRC), which is composed of representatives from local businesses, institutions, civic organizations and city departments. Climate Ready Boston provides the latest climate projections for the city and summarizes how the city can minimize the negative impacts of climate change. The most immediate impacts of climate change in Boston, according to it and other reports, are sea-level rise, increased frequency of extreme heat, and flash flooding. Julie Wormser is the vice president of policy and planning at Boston Harbor Now, which serves as one of several community advisors for Climate Ready Boston. She noted that the impacts of climate change are already being felt in the city, especially more extreme heat days and increased flash flooding. According to the Climate Ready Boston executive summary, sea levels in Boston rose about 9 inches over the 20th century, and another 8 inches of sea-level rise is expected by 2030. Wormser said the impacts of climate change in Boston have thus far disproportionately impacted some groups of people, typically already-marginalized groups such as people with disabilities, low-income residents and the homeless In some cases, extreme weather and heat have been fatal or near-fatal. This map details the areas of Boston that would be impacted by 3 feet of sea-level rise. Three communities, East Boston, South Boston and Charlestown, are at the biggest risk from climate-related flooding. Climate Ready Boston draws attention to climate-justice issues and the ways in which the effects of climate change will continue to disproportionately harm marginalized groups. The report includes a vulnerability assessment, a detailed analysis of eight neighborhoods that are particularly vulnerable to climate change, and a set of climate resilience initiatives to be implemented throughout the city. John Cleveland, executive director of the GRC, said the commission is now focused on communicating these issues and the report’s findings to community leaders, business and trade associations, and members of the local real-estate community. He noted that neighborhood-based resilience initiatives have already begun in two neighborhoods that are at a high risk of flooding: East Boston and Charlestown. 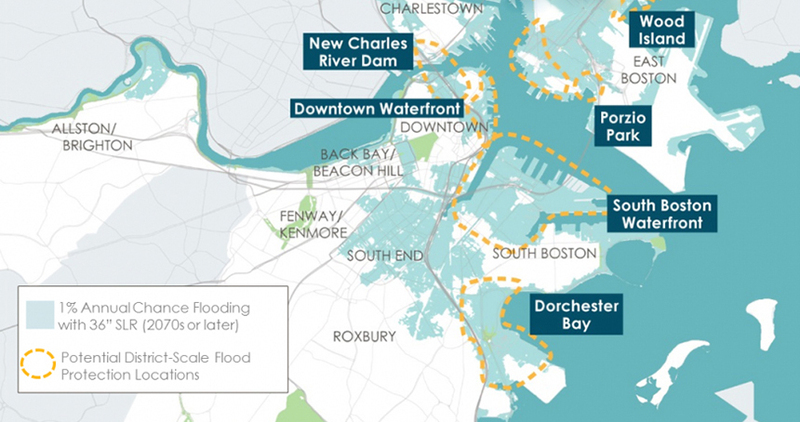 On April 24, the city put out a request for proposals for a third neighborhood-specific coastal resiliency plan in another flood-prone neighborhood, South Boston. Mia Goldwasser, the city’s climate preparedness program manager, has been leading these and other implementation efforts for Climate Ready Boston. She emphasized the need to address resiliency issues at the neighborhood level. because of the unique challenges that different neighborhoods face. Another major project that the city hopes to implement soon, according to both Goldwasser and Cleveland, involves changing Boston’s zoning laws to better account for the effects of sea-level rise, extreme storms and extreme heat. Wormser noted that the need to confront the city’s development community through zoning requirements that account for climate-change impacts and through flood-resilience mandates is crucial, especially given the high demand for land and housing in the Boston area. The Climate Ready Boston report identifies areas that are at the highest risk of coastal flooding. Mike Prokosch serves on the board of the Boston Climate Action Network (BCAN), another community advisory group for Climate Ready Boston. Like Wormser, he emphasized the urgent need for the city to refine zoning codes and better regulate developers, pointing to the Seaport District as an example of a neighborhood that was recently invested in without adequate consideration for sea-level projections. “Past administrations and this administration pushed the whole Seaport District, which was built without a thought to the fact that it’s basically going to be underwater in 50 years ... What do you do about that?” Prokosch said. The Dorchester resident, who has been involved in local climate activism with BCAN for the past decade, believes that changing the zoning and building codes must be a bigger priority for the city. He also said the city lacks sufficient methods for integrating the issue of climate change into its many departments and plans. Rev. Mariama White-Hammond, a minister for ecological justice at Bethel A.M.E. Church and an advocate for local climate-justice issues, called for a “paradigm shift” across city departments if Boston is serious about addressing climate change. Goldwasser acknowledged that increasing collaboration among city agencies is necessary to better address many issues, including climate change. “It is true that we’re structured to fulfill certain missions and have certain operational structures, and that when you put a new issue in the mix, you’re not from the outset equipped to fully take it on in the most efficient way,” she said. While White-Hammond praised Climate Ready Boston for its recognition of all of the impacts of climate change on Bostonians and its neighborhood-specific approach, she said the report doesn’t have enough concrete suggestions and goals for the city itself. “There’s a real recognition at the local level, but not enough there about what [City Hall] is going to do and how we hold them accountable,” she said. Prokosch claimed the city isn’t doing enough when it comes to renewable-energy investments, and is instead focusing only on energy efficiency. “When Trump pulls out of the Paris agreement and Mayor Walsh says the city has to step up and do more now ... why not both? Why just energy efficiency?” he asked. For White-Hammond, climate change at any level of leadership must be addressed in conjunction with issues of equity and justice, such as gentrification and displacement. While climate change will likely displace some Bostonians in the decades to come, she stressed that many people are already being displaced by gentrification and growing economic inequalities. She expressed hope that climate change can be an opportunity for leaders, in Boston and elsewhere, to create new economic and social systems that are sustainable, just and equitable.